They looked so smooth and inviting compared to all the cold, aluminum ones I’ve seen, so I bought them. Then I watched the four free beginning knitting video clips (two-tail cast-on, knit stitch, purl stitch, and cast-off) at Common Threads. They explained it so clearly, they made it easy! Here is my very first knitting! The dark rose one is the swatch I learned on. 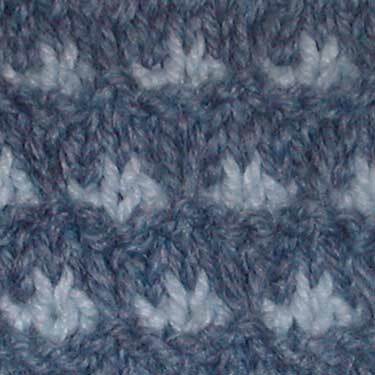 Most of it is knitting, then a few rows of purling, then, at the top, stockinette stitch (alternating rows of knitting and purling). Oh, yes, and my knitting does curl at the beginning and ending edges (as stockinette and some other stitch patterns do), I just have it pinned down for the photo. Yarns: Lion Brand Wool-Ease (80% acrylic, 20% wool), Color 139, Dark Rose Heather; Plymouth Encore (75% acrylic, 25% wool), Colors 436, Blue Heather and 514, Light Wedgewood. Donna, your knitting is very good. I took up knitting last summer after over 30 years of crocheting exclusively, and I love them both. Glad to see you back Donna! And a warm welcome to knitting. 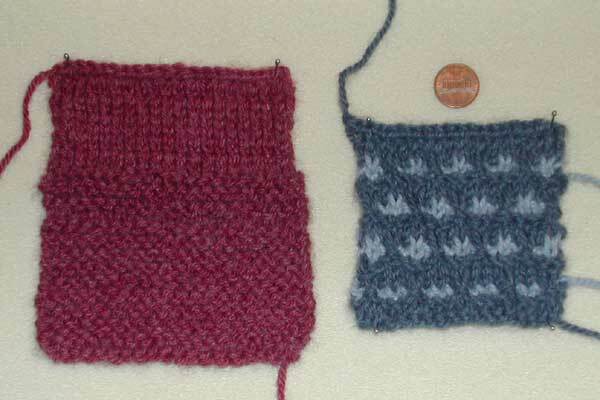 What great first swatches you knit! You’ll be an expert in no time. Great knitting, Donna! They look fantastic! great new buttons! especially the i heart wool one. i want one! gotta figure out how to make one – i don’t have a clue any direction would rock. AND i can’t, for the life of me, get the crochet blogs button to stay on my page. i refuse to be outdone tho, gonna figure this out and getthat button back on my page. my favourite knitting needles were Balenes. thanks so much for the info about their return! I love your new button! :) I’m a big fan of red right now. Thanks for the knitting links. I’ve been trying to teach myself from Knitting for Dummies and Debbie Stoller’s SnB book but I keep throwing the needles across the room. Wonder if my Walmart is going to carry those needles? Very cool. Wow, I have some of the original Baleens from the early ’80s — I’ll have to look for the new ones and see if they have the same feel.